Why Use BioMAX Septic Tank Products? 1. What is a septic system? 2. What is proper maintenance of my septic system? 3. Why do I have to add bacteria to my septic system? 4. Can I use any type of bacteria in my system? 5. Why must I use a 'facultative' bacteria, and what is that? 6. My professional septic pumper recommended that I use BioMAX/PRO, the 100% liquid-live facultative bacterial culture - why should I add more bacteria to the problems that I already have? 7. Are BioMAX septic tank maintenance products dangerous? 8. What will BioMAX septic tank products do for me? 9. Can you be more specific? 10. When should I start my application of BioMAX septic tank maintenance products? 11. How will I know BioMAX is working? 12. Are BioMAX septic treatment products difficult to use? 13. Why must I use a larger amount of the product on a purge application? How often will I be doing this? 14. Where are BioMAX septic treatment products applied? 15. I have no capacity in my system. What can I expect BioMAX to do? 16. Why does the product have a sulfur odor when first applied? 17. Do you add coloring to BioMAX/PRO, because it has a rich purple cast in the jug? 18. Can you name some of the types of home-care products used today that impede the bacteria that are necessary for adequate and proper septic operation? 19. Will common home-care products such as soap and detergents harm the effectiveness of BioMAX? 20. Will BioMAX septic tank products go bad if I don't use them right away? 21. My drainfield is blocked with solids, should I consider a new drainfield? 22. When should I use BioMAX Grease Away? 23. What is the difference between BioMAX/PRO and the BioMAX monthly maintenance products, BioMAX/SMT (dry) and BioMAX/TST/PLUS (liquid)? 24. What is the difference between BioMAX/SMT (dry) and BioMAX/TST/PLUS (liquid)? 25. What are the causes of septic tank system failures? 26. What is excessive water use? 27. Should I use an enzyme product in my septic tank? 28. Why do you say that residential septic systems (on-site wastewater treatment) are environmentally friendly and can be an asset to a homeowner? Q. What is a septic system? A. The septic system is basically an on-site sewage treatment and disposal system. Q. What is proper maintenance of my septic system? A. [The following is reprinted from "The Voice", July/August 1995] Septic system maintenance means two simple things. First, the sludge (inorganic matter) that accumulates in the bottom of the tank must be pumped out periodically. There is no additive that can be introduced into the septic tank to rid the tank of inorganic sludge that settles to the bottom of the tank. It must be pumped out! If not pumped out, it will eventually overflow into the absorption area, causing it to fail. The second part of the septic system maintenance involves the bacteria necessary for solids digestion. Since bacteria killing products of some sort are used in every household, the bacteria must be replenished. If the bacteria are not replenished, the septic system will fill up with solid material and overflow into the absorption area, again causing the system to fail. Q. Why do I have to add bacteria to my septic system? A. Bacteria must be present in the septic tank to digest the organic solids. No bacteria, no digestion - it's as simple as that! Q. Can I use any type of bacteria in my system? A. If there is bacteria in your system, you can use spore or vegetative bacteria to boost the bacteria in your system. However, if there is no bacteria in your system (after pump outs, clean-outs) because of over use or excessive use of caustic chemicals, etc., you must add live "facultative" bacteria. Q. Why must I use a 'Facultative" bacteria, and what is that? A. There is no oxygen at the bottom of your septic tank. Only "facultative" bacteria can adapt to anaerobic conditions. In simple terms, the "facultative" bacteria become bacteria that will thrive in situations where there is no air. Q. My professional septic pumper recommended that I use BioMAX/PRO, the 100% liquid-live facultative bacterial culture - why should I add more bacteria to the problems that I already have? A. Having the right bacteria is an essential part of the solution. Before and after a required pump-out, it is essential that sufficient bacteria be present within your system - to properly digest and liquefy the organic wastes in your septic tank or cesspool. Q. Are BioMAX septic tank maintenance products dangerous? A. Absolutely not! It is non-toxic, non-pathogenic and is completely harmless to man, animal, marine and plant life. It is 100% safe to groundwater. Q. What will BioMAX septic tank products do for me? A. With the application of BioMAX septic tank products, we introduce nature's biological process back into your present system's biological imbalance. This will result once again in the proper biological balance you used to have - AND NEED TO HAVE NOW! A. Sure. BioMAX septic products liquefy organic wastes and suspended solids. This facilitates drainage of the liquid into the subsoil. At the same time odors will be substantially reduced. Q. When should I start my application of BioMAX septic tank maintenance products? A. Anytime... and especially when your professional septic pumper gives you his O.K. The powerful but 100% safe bacteria contained in BioMAX septic tank products will begin immediately to attack the solids within your system. Q. How will I know BioMAX is working? A. Very simply. BioMAX will enter and colonize the lateral lines and holding tanks, keeping them open and functioning. Q. Are BioMAX septic treatment products difficult to use? A. Quite the contrary. It is very simple to use. Unlike many other products that usually have to be mixed with water before being applied - BioMAX septic treatment products need only to be shaken in the jug and can be applied immediately. Q. Why must I use a larger amount of the product on a purge application (new installation and after pumping)? How often will I be doing this? A. We recommend that right after pumping, you purge the system with one gallon of BioMAX/PRO. Your professional septic pumper can do this for you. If you have access to the tank through a clean-out in the main line or if you have a riser, you can apply BioMAX/PRO by using 1 quart of BioMAX/PRO every week for 4 weeks. After the first month, you can spread maintenance dosages to once a month using either BioMAX/SMT (dry) or BioMAX/TST/PLUS (liquid). Continue with maintenance application of once a month until the next pump-out in 3 years when you will repeat the purge application of BioMAX/Pro. 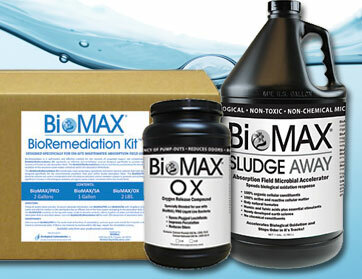 If your system has had any history of failure OR upon recommendation by your septic professional, you should use BioMAX/BioRemediation Kit. This can be done by do it yourselfers that have access to a hydro-jetter to clean the drainlines and a pump truck to pump out any solids in drainlines, however we strongly recommend that you use a trusted septic professional. Q. Where are BioMAX septic products applied? A. Your septic professional will add BioMAX/PRO and BioMAX/BioRemediation Kits directly into the system. He will go directly to the area he thinks the bacteria will be needed most. It might be in a hard to reach outside area, or simply poured directly into the toilet. It's up to his assessment of your individual needs where to apply the BioMAX/PRO. The maintenance products, BioMAX/SMT (dry), are flushed down the toilet. 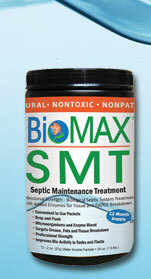 BioMAX/TST/PLUS (liquid) can be applied to any drain that drains to the septic tank and/or flushed down the toilet. Q. I have no capacity in my system. What can I expect BioMAX/PRO to do? A. After the professional pump-out, use the recommended purge disposal as above. Total success does not happen overnight, just as the problem did not develop overnight. You must have a degree of patience - the product will always work, but in systems that have failed, it takes 90 days for the bacteria to work its way into the drainfields. If your local authority or septic professional determines that your system does not have enough capacity, then you should follow their recommendations, which may include adding fieldline to your existing drainfield or replacing your entire drainfield. BioMAX/PRO cannot fix insufficient capacity, but will make any existing capacity work to the maximum possible. Q. Why does BioMAX/PRO have a sulfur odor when first applied? A. That is because it is 100% natural! This should not be looked upon as a problem, as the odors quickly disappear upon reapplication. Q. Do you add coloring to BioMAX/PRO, because it has a rich purple cast in the jug? A. BioMAX/Pro does not contain any masking agent or artificial coloring. The bacteria cultures are from the Thiobacillus purple sulfur group - again, 100% natural! Q. Can you name some of the types of home-care products used today that impede the bacteria that are necessary for adequate and proper septic operation? A. Some examples of the "culprit' products are: excess acids, shampoo, anti-bacterial soaps, antimicrobials, antivirals, antiseptics, bleach, caustic drain openers, cleaning compounds, chlorine materials, disinfectants, lotions, medicinal residue, polishes, sink & tub cleaners and toilet cleaners. Q. Will common home-care products such as soap and detergents harm the effectiveness of BioMAX? A. The modern home uses a myriad of cleaning products; all of them have some effect on your septic system. The bacterial cultures in BioMAX are resistant to many of these products and will actually break them down to harmless by-products. Overloading your system with these products will require a lengthier period of time for BioMAX to degrade these materials. Common sense and following manufacturer's dosages will save you money and extend the useful life of BioMAX in your system. Will BioMAX septic tank products go bad if I don't use them right away? A. No, every BioMAX septic bacteria product will not go bad; this special formula we have developed has an excellent shelf-life. The bacteria have been trained (so to speak) to lie dormant in the jug, and will become 100% active once they are introduced into an organic waste environment. Q. My drain field is blocked with solids, should I consider a new drain field? A.Only as a last resort and only on the recommendation of your professional pumper. BioMAX/BioRemediation Kits should help to reverse the clogging. However, it's up to you to start a maintenance program and to keep a watchful eye for the warning signs of septic system failure. Q. When should I use BioMAX/GREASE AWAY? A. You should use BioMAX/GREASE AWAY when your Septic Professional recommends it. Theoretically there should be no grease in the drainlines or the septic tank. Our experience, however, is that most people don’t know about the detrimental effects of grease, and those that do are not always disciplined to pour out grease or to wipe pots and pans of grease before washing. If you suspect that grease is going down your kitchen sink or dishwasher, first, try and reduce the amount, and second, apply 1 quart of BioMAX/GREASE AWAY to kitchen sink once a week for 4 weeks, then apply a maintenance dosage of 2 ounces a week after that to the kitchen sink. Let the water run for 60 seconds at lukewarm temperature after each application. The best time to apply is right before bed when there will be no kitchen sink usage for the rest of the night, nevertheless, you can apply at any time. Q. What is the difference between BioMAX/PRO and the BioMAX monthly maintenance products, BioMAX/SMT (dry) and BioMAX/TST/PLUS (liquid)? 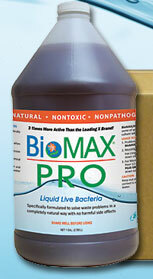 A. BioMAX/PRO is the most effective bacteria on the market and in our product line. BioMAX/PRO can be used as a monthly maintenance product if your system has a clean-out access in the mainline or a riser. Because of the strong sulphur smell, it is our experience that most people do not like to apply it indoors. Therefore, we recommend using it as the initial or “purge” application after a new septic tank installation and after every tank pump out. Your septic professional can apply it at that time so there is no worries with odor. BioMAX/SMT (dry) and BioMAX/TST/PLUS (liquid) are our signature monthly maintenance products designed to be applied indoors. Q. What is the difference between BioMAX/SMT (dry) and BioMAX/TST/PLUS (liquid)? A. Both are designed to be applied monthly as part of your septic tank maintenance plan. Part of the choice is personal preference. BioMAX/SMT comes in dry powder form in disposable biodegradable packets. Just flush the intact packet down the toilet once a month and you are done. BioMAX/TST/PLUS comes in liquid. Because it is liquid, it can be divided among the drains and toilets and help keep drains clean and odor free. Just measure out 10 ounces and divide between the drains (sinks and tubs) in the house once a month. Either product is highly effective on the septic tank system. The BioMAX/SMT is more convenient. The BioMAX/TST/PLUS is convenient, but requires a few more steps and offers more options. Q. What are the causes of septic tank system failures? A. Septic tank system failures are caused by 1) improper maintenance 2) Excessive water use 3) roots 4) mechanical failure such as line collapse, baffle tee failure or line disconnect. The #1 cause is maintenance and that’s where proper application of BioMAX bacteria products prevents failure. BioMAX septic products cannot fix the other three causes. Your septic professional can diagnose and provide solutions to root blockages and mechanical failures. Excessive water use can be solved by fixing water leaks and reducing water use by occupants. Q. What is excessive water use? A. Depending on the geographical area, systems are designed for certain amounts of water. In Georgia, a system is designed based on 75 gallons per bedroom per day. So for a 3 bedroom house, the monthly water usage should not exceed (3br x 75 gal/br x 30 days) 6750 gallons. In Florida or California where the soil more sandy and drains faster the design is based on 100 gallons per bedroom per day, so for a 3 bedroom house this would be 9000 gallons. When water usage exceeds this amount on a consistent basis, there is a high probability that your septic system will fail, either backing up into the house or busting out on top of the ground in the yard over the drainfield. Q. Should I use an enzyme product in my septic tank? A. No. Enzymes, in a simplified explanation, are proteins that are produced by bacteria to break down the solids in the septic tank so that the bacteria can digest them further. If you have read our section “How Septic Systems Work”, you recall that the septic tank develops a sludge layer on the bottom of the tank, a scum layer on top of the liquid in the septic tank, and a mostly liquid layer in the middle which is delivered to the drainfield by the outlet baffle thereby blocking solids from entering the drainfield which would cause failure. When a solely Enzyme product, or a product that is built around enzymes is used on a septic tank, our experience in the field is that this will cause damage. Many competing brands focus on Enzymes. Enzymes break down the solids in the septic tank and suspend them throughout the tank uniformly creating a soup or slurry. The bacteria cannot break down these solids because there have been none added and the existing bacteria are too few or too compromised to break down all the solids. Since there is no liquid layer in the middle, the slurry with suspended solids goes out into the fieldlines which eventually causes problems, even failure. That’s one reason why we started this company. We saw this over and over in the field and we wanted to provide a solution. Since bacteria produce only the amount of enzymes they need, the solids are digested as soon as the bacteria produce them. That’s why a septic treatment product should consist of only the most effective and hardy bacteria we can produce. Our technicians are usually able to tell if a customer has been using an enzyme product because instead of a scum layer on top and sludge layer on bottom with mostly liquid in the middle, they see a soup or slurry with solids suspended throughout. Our experience in the fields show that enzyme based products can do more harm than good to septic systems. Q. Why do you say that residential septic systems (on-site wastewater treatment) are environmentally friendly and can be an asset to a homeowner? A. A properly designed and maintained septic tank system is environmentally friendly. First, a septic system encourages water conservation for the homeowner because there is a water limit to which the system can handle. Second, it is not sent to an open sewer system which can overflow to streams or lakes in big storms, and it is not sent to a huge sewage treatment plant with all it’s costs and challenges. Human waste is delivered to a septic tank where bacteria break it down, then to the fieldlines where it is broken down further and then is filtered through the soil. 70% of the water evaporates through the soil or yard above the lines in a properly designed tank. This water has been filtered by soil and broken down into organic components that vegetation use. The other 30% percolates through the soil being filtered until it reaches the groundwater. Nature perfectly filters the water returning it to the ground water. Third, it saves the homeowner money because the average cost for sewer is the amount of the water bill. Even with septic tank maintenance of pumping and monthly bacteria applications, the homeowner saves thousands over sewer costs in the long run. Fourth, septic systems encourage the homeowner to use environmentally friendly cleaning solutions. We are developing a line of environmentally friendly household cleaners. Stay tuned. Home | Septic Tank Treatment Products | About BioMAX | How Septic Systems Work | Why Use BioMAX Septic Tank Products?